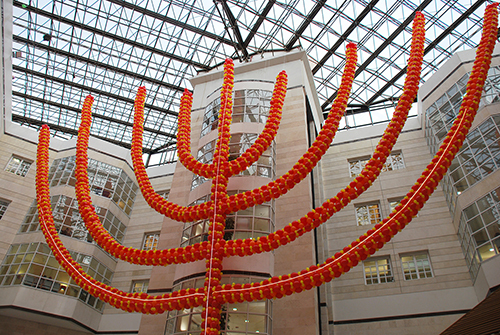 A huge channukiah (menorah) of balloons was erected on December 1st in the lobby of the hospital to mark the onset of the Festival of Lights and the lighting of the first candle. The channukiah was installed at the initiative of the Hope and Care non-profit that supports the Nephrology Institute at Schneider Children's, and Assaf Balloons. Comprising 12,000 balloons at a height of 24 meters and 21 meters wide, the channukiah was designed and engineered by artist Assaf Balloons, and put up by 60 volunteers from Hope and Care. They were assisted by snappling enthusiasts from “Sport Attraction”, who generally deal with rescue operations and extreme sports, but this time they were recruited to help erect the channukiah. It took almost 12 hours to erect the channukiah which started on Saturday evening and finished early on Sunday morning at dawn. The initiative has become an annual tradition for Hope and Care to encourage and cheer patients and their families during the 8 days of the Festival. Hope and Care supports the Dialysis Department in the Nephrology Institute at Schneider Children’s, and organizes various activities for children and provides assistance to families. 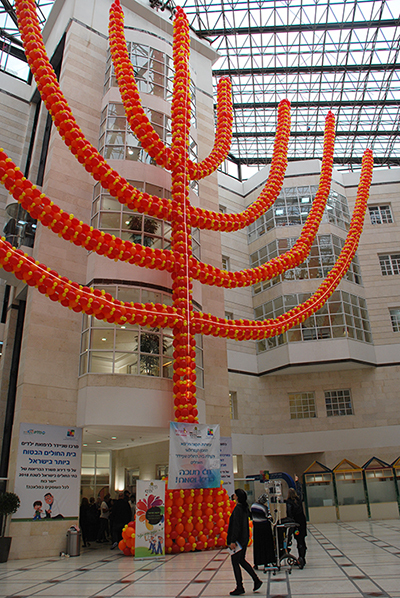 Assaf Balloons has volunteered with the non-profit for the past 5 years in creating exciting and innovative balloon structures for hospitalized children.